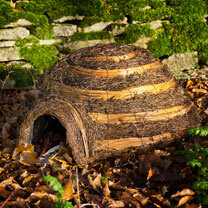 Make your garden a welcoming spot for hedgehogs, with this beautiful Igloo Hedgehog House. Designed to blend in with the colours of your garden, this hedgehog house provides hedgehogs and other small mammals with a safe haven. With a small tunnel entrance and designed for shelter, it has plenty of space inside to accommodate family groups, but can also be used as a covered feeding station. With additional brushwood cover, it can also be used for hibernation. Place under a hedge, large shrub or similar concealed place, out of the prevailing wind. 59 x 53 x 22cm.